(Grus canadensis) During mating, pairs vocalize in a behavior known as “unison calling.” They throw their heads back and unleash a passionate duet—an extended litany of coordinated song. What does the Sandhill Crane eat? Sandhill Cranes are omnivores. They are opportunistic eaters that enjoy plants, grains, mice, snakes, insects, or worms. 20 years in the wild. 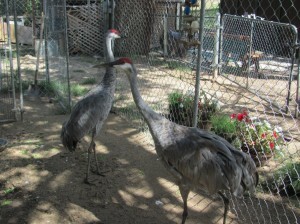 How many sandhill cranes can be born at a time? Females typically lay two eggs, which both parents incubate. Males take responsibility for defending the nest. These large birds are found predominately in North America. They range south to Mexico and Cuba, and as far west as Siberia. They can weigh from 6.5 to 14 lbs. Cranes dance, run, leap high in the air and otherwise cavort around—not only during mating but all year long. During mating, pairs vocalize in a behavior known as “unison calling.” They throw their heads back and unleash a passionate duet—an extended litany of coordinated song. Niles – came to the zoo in 2000 from a rehabilitation facility in Florida. He could not be released to the wild because he had a damaged wing and could not fly. Daphne – came to us in 2006 from a rehabilitation facility in Michigan and she was extremely imprinted. They tried to release her several times but she would just come back to their facility, so she found a permanent home with us. Both Daphne and Niles like to play with toys and are very curious (Daphne more so than Niles). They often can be heard “trumpeting” in the zoo and patrons always ask us if we have elephants because they are so loud and sound a little like elephants. This is just one of their normal vocalizations.